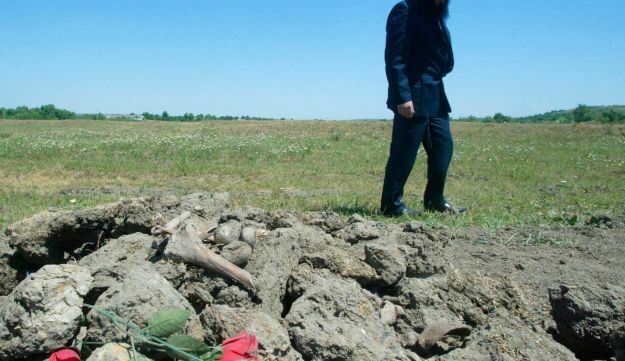 Thanks to the Ukrainian government, and the lack of interest from the global Jewish community, the physical remains of Holocaustvictims are now being desecrated on a regular basis - and their memory quickly erased from history. This July, I travelled with a 30 member group from our synagogue to the Sosinski Forest outside of Rivne, Ukraine. 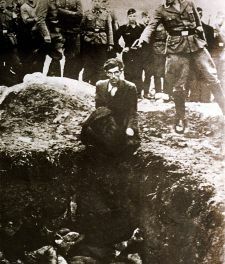 Between November 5-6, 1941, all the Jews of Rivne, more than 17,000, were taken to the Sosinski Forest and killed by Nazi firing squads. We traveled to Sosinski to honor their memory. As we arrived at the site we looked down and saw large gaping holes. We saw bones scattered all over the earth. My son looked up at me and said, "What is this?" He was holding a skull. What was supposed to be a protected memorial site had been raided the day before by gravediggers, who, according to Ukrainian police, were looking for gold. We looked down at our feet and picked up skull fragments, a full set of teeth, a vertebral body, and other bones and buried them in a Jewish funeral. Sadly, this is not unique. As we traveled around Ukraine visiting the sites of mass graves we found that grave looting is a regular occurrence. The Ukrainian government is well aware of the looting - and is not doing enough to stop it. If a looter gets caught, he receives a fine of less than $100 - and is released. When I wrote a letter to Petro Poroshenko, the president of Ukraine, regarding the matter of grave looting and swastikas that I saw painted prominently on major streets in Rivne, I was simply told by the Ukranian Embassy to the U.S. that Ukraine does not have an anti-Semitism problem. Such a response is inadequate, and does not address any steps being taken to protect these sites from future desecration. Some might argue that the matter of bones is not that important. After all, we have plenty of problems with the living which we should deal with before we worry about the dead. But, actually, the way we allow these bones to be mistreated tells us plenty about the living too. The matter of grave looting is part of a larger issue of neglect of mass graves and concentration camps in Ukraine. In the city of Lviv sits the Janovska concentration camp. Janovska is known as the Auschwitz of Ukraine. It was a place of unspeakable evils, where over 100,000 Jews were murdered. Today, Janovska looks like a garbage dump. When our group visited Janovska we encountered human bones laying openly on the ground, drug addicts, endless hypodermic needles, and tons of trash. It was by far the dirtiest place we saw in the otherwise beautiful city of Lviv. And yes, we also saw strong evidence of grave looters. There are at a minimum, hundreds of sites of mass graves in Ukraine. Almost all will soon be covered up and erased from memory. In his Nobel acceptance speech, the Holocaust survivor, Elie Wiesel said, "If anything can, it is memory that will save humanity." But for the murdered Jews of Ukraine there is hardly any memory. 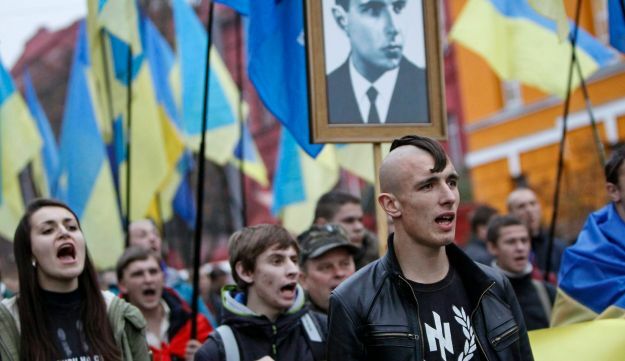 The Ukrainians themselves will surely not guard the memory of the murdered Jews, as the country is unwilling to deal with its own dark history of collaboration with the Nazis. To the extent that Ukrainians do get involved in preserving the graves, it is often by promoting their own history at the expense of murdered Jews. For example, at the mass grave in Sambir, where nearly all the Jews of Sambir were murdered, there stand three crosses, despite the fact that only Jews lie in that mass grave. The Jewish community is at fault here as well. Many Jewish schools and organizations make it a point to visit the crematoriums in the death camps in Poland, but not Ukraine, which experienced a Holocaust perptrated by bullets not gas chambers and camps and is therefore lacking structural historical reminders. If Jews don’t visit these mass graves then how can we expect others to protect and preserve the cemeteries of our holy martyrs? If no one visits these sites of unspeakable evil, then grave looters will no longer be the problem, as their bones will be covered by parks, hotels, metro stations, and supermarkets. This is already happening. There is a metro and restaurant station on the ravine of Babi Yar, where nearly all the Jews of Kiev were murdered. The mass graves have been turned into garbage dumps, restaurants, and train stations. And at Babi Yar where there is a small memorial for the murdered Jews, there is also plaque glorifying Ivan Rohach, editor of a radical nationalist and collaborationist wartime newspaper, who called for the elimination of all the Jews from Kiev, and the Jews in general as the "greatest enemy of the people." The world stood by silently as the 1.5 million Jews of Ukraine were murdered. Now the world (and even the Jewish community) is largely silent as their memory is erased and desecrated. This sends a clear message to the murderers. You can commit cold-blooded mass murder on a massive scale and the world won’t care - not now, and not ever. If we don’t do a better job of safeguarding their memory ,then not only are we complicit in the cover up of their murder - we are sadly all partially responsible for the next mass murders, which will surely come.